What a week for reviews! Nothing but top rate courses here. Rest assured I am not being overly lenient on the ratings, I just think my society schedules and To Play list lined up perfectly enough to bring some nice courses to the list. As a side note, you may notice a difference in (or lack thereof) pics for today’s courses. I encourage everyone to submit their courses to the TGC Tours database, which ensures that we snag some nice snazzy pics of your course from Vic, aka karma4u, and I don’t have to hunt down your pics from multiple locations! This is a well thought out strategic links course from start to finish. There are very few straightforward tee shots here, and plenty of challenging carries to each green. Once you get to the greens, the heavily sloped surfaces and precarious slopes make converting birdies, or more likely saving pars, very difficult. Thankfully the greens are medium speed, but even at that setting there were a few greens and pin positions that felt a little borderline. The challenging round is accompanied visually by everything that you would expect for a links course. There is plenty of open horizon and rolling terrain, making picking your target line (without the help of the aim cam) half the battle. Overall, a great template for anyone looking to create a fictional links course. 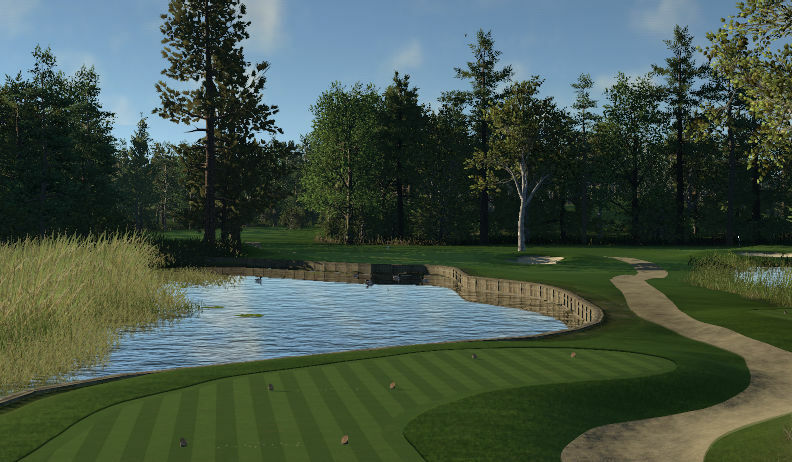 Old Beaver Creek arrived in the early days of TGC1 and stuck around as one of the highest ranked fictional courses in the game, for the life of the game. Just play it and you will know why, as the hole designs, elevation changes, and green designs all provide a fair and interesting challenge on each shot. I was also struck by how heavily planted the course was, which is another thing that you don’t often see with newer courses. I’m normally a fan of open courses, but I like the tightness of this course and navigating through the woods. The only flaw here is that it appears at least one, if not two, holes had their par changed during the TGC2 transition. Everyone has to play the same par, though, so I won’t worry too much about it. 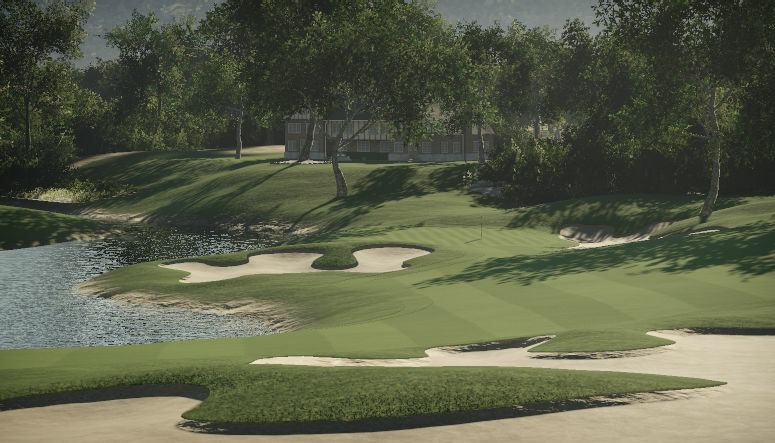 Here is another course that occupied a spot in the TGC1 pantheon, and the TGC2 version does, as well. The highlight here is the meticulously planted course, where not an inch of the plot is untouched. Combined with a great light setting, and you have one of the best looking courses in the game, and most realistic, too. The course itself is fair, and allows you the opportunity to go really low if you are on your game. There is just enough of a challenge thrown in, though, that it can eat you up if you are off your game like I was. The greens have no crazy breaks, but enough constant movement that a terrible putter like myself could not match a line to a speed the entire round. There is something here for everyone, from the casual golfer to the sim player. This is a nice change of pace, both as a 9-hole par 3 course, and as a winter course. The use of water mist to simulate steam coming off a not yet frozen pond is genius. The holes are mostly all short with angled greens, so your goal here is to dial in your short irons, find the area below the hole, and convert your putt. It’s not a pushover by any means, and should give you a quick and fun round that you can come back to often. A good portion of my rounds come from society play, so that fact that so many courses from reebdoog keep coming up says a lot about the designer. Like most of his courses, this one looks good and plays great. There is plenty of width here, so the large sprawling bunkers match the theme well. Par is defended here by greens with lots of significant movement, so playing your approach to the right area is key. You should get nothing but solid rounds from this course, and another great course added to the library. 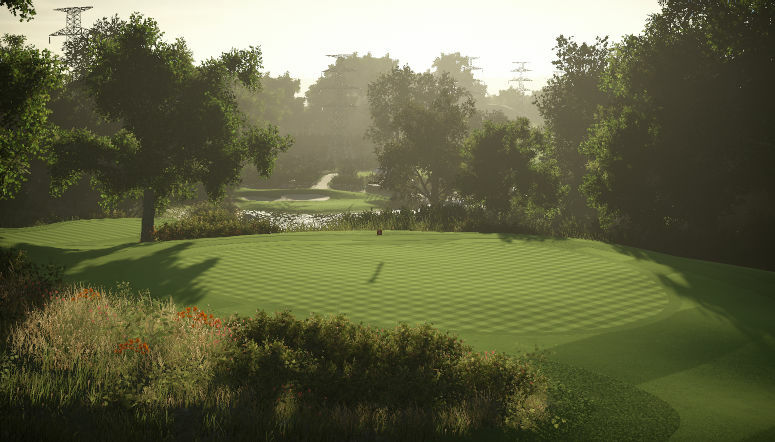 You likely haven’t heard of this course, but you won’t have any trouble believing this is a real course, as it is one of the most realistic looking and feeling courses in the game. It’s not a long course by any measure, but it’s tight off of the tee, with plenty of strategically placed trees that will force you to lay up, or put some serious curve on your ball. Add in high winds and max speed greens, and you have a very tough test in TGC2. The fast greens may not be for everyone, but placing your ball in the right place gives you a real chance to avoid 3 putts. It goes in my pantheon due partly to the challenge, but mostly due to the pureness of the scenery. This is my final RCR to be ported over from TGC1. The course had to be replanted due to the elimination of the Links theme, so it will look a little different. This is a par 71, as opposed to how it played in the US Open as a par 70, due to both the 1st and 18th holes playing as par 5’s. The 4th hole also plays as a par 5 in real life, but I enjoyed the approach shot better as a par 4, as it played in the US Open. The Black tees are just under 7500 yards, so a little shorter than the US Open, while the Blue tees are near 7100 yards and similar to the tips on the Chambers Bay scorecard. I recommend both for the all around experience of the course’s versatility.